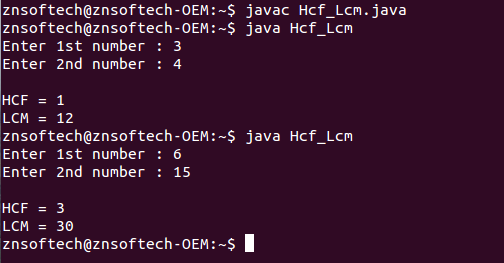 Java program to find the HCF(Highest Common Factor) & LCM(Least Common Multiple) of two numbers using recursion. 2. Accept two numbers from user. 3. Using method of recursion, find the HCF. 4. Find the LCM by multiplying the numbers and dividing by their HCF. 5. Print HCF and LCM.